Tolkien’s texts are notable for their abundance of characters, many of them mentioned perhaps only once, other playing very important parts in the stories. However, it is often very difficult to find any description of how those characters look, and this is what we, artists and illustrators, are usually most concerned with. So here it is – Tolkien Illustrator’s First Aid Kit – a list of all those characters, whose physical appearance is mentioned in the texts, including The Silmarillion and The History of the Middle-earth. To start with, the Elves. As we know, during the march from Cuiviënén they were divided into three hosts. Sindar were part of Teleri, so I decided to treat them along with them. 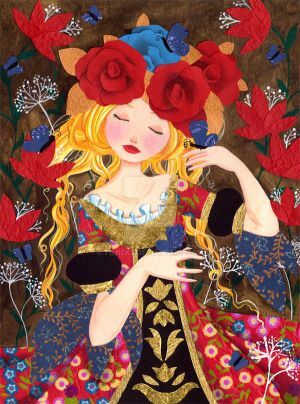 She was younger in the years of the Eldar than her brethren; and when she was grown to full stature and beauty she was greater and stronger than woman's wont (...) – J.R.R. Tolkien, Morgoth's Ring. As both Idril and Tuor were fair-haired, we can guess, that their child also had golden hair. Please note: this is a description of Elrond in the Third Age. In the Second Age, in his youth, he would probably look a little different, as there would be not as much “memory of many things both glad and sorrowful”. Finduilas ther Daughter of Orodreth was golden-haired after the manner of the house of Finarfin - J. R. R. Tolkien, Unfinished Tales, Appendix to Narn I Hîn Húrin. 'the first and last of Nerdanel's children had the reddish hair of her kin'- J.R.R. Tolkien, The Peoples of the Middle-earth: "The Shibboleth of Fëanor”. The hair of Olwë was long and white, and his eyes were blue– J.R.R. Tolkien, Morgoth's Ring, The Later Quenta Silmarillion: “Of the Coming of the Elves". As Noldor generally had dark hair, we can assume that Voronwë was no exception to this rule. If you know any other descriptions, please let us now (comment below or send us a note), and we’ll add it to the list. "In general the Sindar appear to have very closely resembled the Exiles, being dark-haired, strong and tall, but lithe." "The Númenóreans ... are in constant communication with their ancient friends and allies, either in the bliss of Eressea, or in the kingdom of Gilgalad on the shores of Middle-earth. They became thus in appearance and even in powers of mind, hardly distinguishable from the Elves..."
'' But in the dim dusk of a winter's day there appeared suddenly among them a man, as it seemed, of great bulk and girth, cloaked and hooded in white...'' - Keep in mind that he’s one of the Sindar the Noldor were in general larger. Thank you for the descriptions, especially about Beleg and Numenoreans, though without adding the sources it will be hard to check them. Regarding the Noldor we've already have some of these on the list. 1) Appendix to Quendi and Eldar (the Awakening Legend). 2)The History of Middle-earth, vol. XI, The War of the Jewels: "Quendi and Eldar,". 3)The History of Middle-earth, vol. XII, The Peoples of Middle-Earth: "Of Dwarves And Men". 5)Unfinished Tales of Númenor and Middle-earth. 6)Lay of the Children of Húrin. and down unto her silver feet. some part of what thy dark eyes see!" "'What then was Queen Melian like,' quoth Eriol, 'if thou hast seen her, o Veanne?' 'Slender and very dark of hair,' said she, 'and her skin was white and pale, but her eyes shone seeming to hold great depths. Clad she was in filmy garments most lovely yet of the hue of night, jet-spangled and girt with silver." Ok, one more question about Elven appearance ( you knew you were going to get caught in your own labour, didn't you? ). I've discovered only recently that the so frequently cited quote about Maedhros as being similar to Mahtan " in mood and face " may have been extracted from Vinyar Tengwar's essay " from the Shibboleth of Feanor ", vol. #41, which collects some previously unpublished bits from the Shibboleth. Does anyone own this old volume of the Vinyar? Is this quote about Maedhros appearance and mood really existing, or it is just fan-lore? Thank you! Yes, that information appears in VT41 and it is indeed from "The Shibboleth of Fëanor". It states Maedhros was alike his maternal grandfather in face and disposition. Very interesting, thank you! I'm going to purchase this volume then, these bits of news found on the internet have made me eager for more! Well, unless you're really into linguistics (and have a strong background in the subject), VT will likely be a total bore for you. However, information such the one discussed is always published in other places, so you don't really need to buy VT to find out about it. Thank you! I've read some extracts from VT and found them difficult indeed, but quite interesting... Sure I've not any strong linguistic background, though! Thank you for the informations! Wow, this is GREAT! I'd filed away most of these in my mind (or drawigns, but it's so good to have them all in one place and so well researched! Thank you so much for this. Ah, and Aegnor's anime hair. I've read that so many times now, but my brain refuses to remember that. I wonder about it anew every time I see it. Ahah, Aegnor's hair! Even if the description evokes some definitely umbefitting dragonball visions, I always imagined the damn " strong and stiff " hair as simply frizzy, despite the strong ethnic connotation such hair bore. Ah, just noticed, there's no Beleg Cuthalion here? OK, Gwindor is lying among roots of the biggest tree. Here is illustration by Tolkien where you can see Beleg [link] Though finding a bigger image version would work better, Beleg is tiny and I can't see Gwindor. Is there any description of his appearance in the books? There's that strange fanon thing that he had silver hair and green eyes. O_o I have absolutely no idea where that comes from. He certainly is *depicted* by Tolkien as dark-haired. Ah, now it makes sense! Thank you, Jenny! I always read about those silver hair in fanfictions, so I assumed it was his actual colour... Thank you for the link to the drawing! Generally, it's a good idea to mistrust silver hair and green eyes. especially in combination. It just screams fanon. No. As a matter of fact, there's only one elf in all Tolkien's writings that is not expressly grey-eyed, and that's Eärendil. And Miriel too. She have dark eyes. Also Finwe have a "grey-blue eyes". It must be from a fan fic then. The same fanon for Lindir and Ecthelion, who often end up being silver haired, but there are no descriptions of their looks so why not. I never stepped on silver haired Beleg, but because of fan art I always see him with short light brown hair. I don't remember any description of him, though (nor whose fan art that was). Do you remember where is it? I could add it to the list. Also I wonder if Celebrían's name translation alone is enough to place her on the list as silver haired ("silver queen" in Sindarin). Maybe there should be facts (quotations) and speculations section. Freakin' great journal! Now there's no need for me to go over the books every now and then just to get the descriptions right. Handy to everyone We wanted to make the other races, too, but time will show if anything happens. Could Maglor be added to the list as well? If there is any quotation we could use? Ah--hm. I'll have to look and get back to you. Celebrían is missing on the list, however it looks like all we have is her name which means "silver queen" in Sindarin. This suggests silver hair, though is not 100% proof. Gotta say, this is the most useful blog I've read in quite a while! Great work here and pretty much helpful too ! Wow, it's so helpful, I just needed this, thanks 4 patient, it's GREAT! Art submission guidelinesWelcome to the Quenta Silmarillion, sit yourself down by the fire and hear the stories of old. 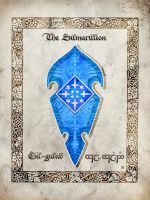 The Silmarillion-Club is a group on deviantART centred around the early events from the world created by J. R. R. Tolkien: from the beginning of time up to the ending of the II Age of Sun, described in The Silmarillion, The Unfinished Tales, The Children of Hurin and The History of Middle-Earth. We welcome art inspired by the early events from the world created by J. R. R. Tolkien: starting from the Music of the Ainur up to the end of the Second Age of Sun, as described in The Silmarillion, The Unfinished Tales, The Children of Húrin and The History of Middle-Earth. Getting your light right when creating a photomanipulation sounds easy . . . until you sit down to try to do it! There are seemingly endless things to keep in mind: where the light source is, the intensity of the light, how pieces of your manipulation need to be composed so that they line up with the direction of the light in the piece, whether there could be multiple light sources, what color the light will be. . . .
And the goal for light in your manipulation is for the light to be consistent throughout so that it is telling a story. No pressure! It is not an overstatement to say that light will make or break your manipulation; I have declined many DD suggestions because of bad lighting. Current dA submissions guidelines define "Fantasy Photomanipulation" as photomanipulation that focuses on a fantasy theme. We have therefore set out to speak with our fantasy constituency and gain a better understanding of how they see and define the complexities of fantasy photomanipulation. PE: Finding Critique on dAWhere to find Critique on deviantART? So, you just uploaded your latest image/writing onto deviantART and featured it in your gallery with a slight satisfaction you have achieved something. Fantastic, that is step one and now you can sit back and watch everyone's responses come pouring in and showing you everything you need to do to make your work even more fabulous. The fact is; getting someone to critique your work isn't as easy as that. If you want critique, you need to seek critique and put in the good effort to get it. It won't always work, no plan is fool proof, but here are some places and advice that could help you find the feedback you desire. Not every place on this list will be your cup of tea, but try and see what works for you. Step one: Make sure people know you want a critique! Talks with Tolkien artists - complete listA complete list of all interviews from the "Talks with Tolkien artists" series. It will be updated after each interview posted. Hello everyone We have a new contest for you. This one is very open ended to allow for maximum creativity . This time, we're asking you to create a Fan Art that connects to music in some way. Whether there's a certain song that has always reminded you of a certain character or theme, or if you secretly want to draw a battle of the bands AU, or maybe you love a character who is also a musician, or maybe there's a song that you want to illustrate, this contest gives you a lot of options! Create a piece of Fan Art that connects thematically to music. Some suggestions have been listed above, but feel free to deviate from them! My dear watchers, I really appreciate your support when it comes to fight against art-thieves. But I bet there are also many people whose thoughs can be interpretted like "why is she so hysterical about it?". Some people say, that the fact, that some photo is worth stealing, is a kind of compliment. Ok, so let me present my point. At first: why am I so unhappy about reposting of photos? Because, pals, if somebody just reposts a photo without any change, it just gives totally open space to other people who would find the photos on his/her blog, taking it and posting it themselves. And because the first person did not credit the original author, they also do not credit the creator. The more people do that, the more times the photo is reposted. Always without credit. Sooner or later, it becomes a kind of "public" property and original author has almost no chance to effect this situation. The Muse - contest #10This contest has ended. The winners annoucement can be found here. Hard-working or lazy, reliable or capricious? A new contest for the new year: have you ever thought of portraying your creative vein as an actual being? Would it be a handsome woman or a hard to tame bird? Or a sloth (I hope a lively one, at least)? Does it walk around with you or stays and waits in some certain places? Or catches up with you all of a sudden no matter the location? The task is to describe or depict that part of your mind responsible for all the brilliant ideas standing behind your creations. Or would it be a self-portrait of some kind? Limit of submissions: one piece per member. The entry must be prepared for the contest precisely. You must be a member to participate. The deadline for submitting a deviation for this contest is February 17th. Contest entries should be shared in the replies of this blog entry. The idea of this contest is to imagine your favorite canon characters, who either appear or don't appear in the movies, in a scene found in the book but not (yet) depicted in the movies. Talks with Tolkien artists: gilronanAllow me to introduce you a wonderful professional artist and Tolkien illustrator who joined deviantArt just recently, Joe Gilronan :icongilronan: - gilronan. I am a full time professional artist and create work exclusively influenced by the writings of J.R.R Tolkien. I am originally from Chester, England but have lived in sunny Southern Spain for the last 6 years. I have exhibited and sold work world wide and work primarily in oils, acrylic and clay. 2. When did you read Tolkien's books for the first time, and what impression did they leave in you? Tolkien Illustrator's First Aid Kit: ElvesWelcome to the Quenta Silmarillion, sit yourself down by the fire and hear the stories of old.